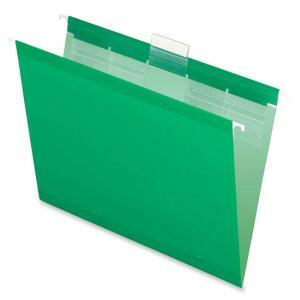 No need to attach tabs with these hanging file folders. Clear tabs are already permanently attached to Ready-Tab Reinforced Hanging File Folders. Included letter-size, printer-ready insert sheets are designed for use with clear tabs and come in a dispensing box with perforated section for easy, one-at-a-time access. Hanging file folders feature Infopockets for filing small papers, photos, and disks. Reinforced with patented polylaminate at all critical wear points. SFI Certified.